- 4x 80x80x25 2800RPM fans, 3.72m3 total controlled by intelligent cooling system FanMagic® The use of controller increases reliability of hardware work due to total monitoring of cooling system and signalling in case of failure. The use of controller combined with the system of redundant cooling allows to create fault-tolerant system with long-life performance. The PSU is installed in chassis in special housing (look at the photo). The Rail Kit to mount chassis to 19" wall mounted cabinet/frame consists of two symmetric Holders - left and right. Each Holder consists of two parts - Holder itself (1) that supports shassis and Bracket (2) that fixes holder in rack and makes holder rigid. Fasten Brackets to Holders with nuts (3) as shown on the picture on the left. Install 10 cage nuts in the cabinet/frame (not supplied with the Kit). Refer to the picture on the left. You should install 5 cage nuts (red marked): 3 - on the front (3) and 2 - on the side of the rack (1). Tighten the both Holders with 4 appropriate screws: 2 - on the front (4) and 2 - on the side of racks (2), (5). You need to tighten 8 screws total. Note! 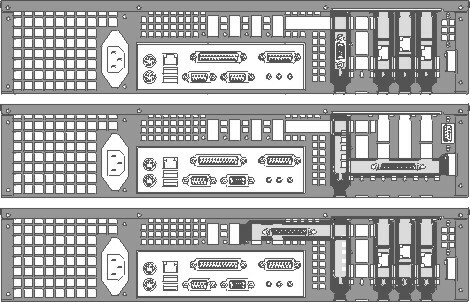 Please make sure the salient side of each Holder (left and right) is in the opposite position in the rackmount. Slide the D21 based system along the pre-installed Holders in the suitable rack. Tighten the rest 2 screws on the opposite side of the front panel where it attaches to the rack. The DR-2U-500 Slide Rail Kit to mount chassis to 19" wall mounted cabinet/frame consists of two symmetric Holders - left and right. Each Holder consists of two parts - Front Bracket (1) and Back Bracket (2). Slide together the front to back sections of the Holders as shown on the picture on the left. Extend the Holders to the	length required to fit the rack or cabinet before you install it. The DR-2U-500 Kit supports rack fixing distance on depth L from 400mm to 638mm. Notify, there are two variants to join Back Bracket (A and B). Screw on appropriate nuts (3) (supplied with the Kit) to each bracket, and tighten the front and the back sections. Install 10 cage nuts in the rack (not supplied with the Kit). Refer to the picture on the left. You should install 5 cage nuts (red marked): 3 - on the front rack (1) and 2 - on the back rack of the frame. Tighten the both Holders with 4 appropriate screws for EACH SIDE of the rack (left and right, front and back). You need to tighten 8 screws total.